This is an absolutely delicious chicken thighs recipe making the prominent use of black olives, garlic and lemon juice. The blend of those three ingredients, along with the subtle touch of thyme, make for an excellent meal that looks very fancy and sophisticated, but that’s easy to prepare and doesn’t require any fancy ingredients. Everything is prepared in a single pan, which makes it extra-easy to clean up afterwards. The added sliced lemons give even more lemony taste and offer visual sophistication. This chicken recipe shares a lot of similarities with French Provençal cuisine. Provence is located in the Southeast of France and their cuisine is known worldwide, especially for the extensive use of olive oil, garlic, olives, sardines and anchovies. In other words, it is part of the typical Mediterranean cuisine. They have a multitude of traditional fish, lamb and goat dishes. Thyme, which is called for in this recipe, is part of the herbs that we call herbes de Provence and also usually includes savory, fennel and basil. Make sure to choose quality black olives that are packaged either in olive oil or a brine containing only salt and water. Italian specialty food stores usually offer a great variety to choose from. Kalamata olives, originating from Kalamata in Greece, are a delicious and popular choice. We hope you’ll enjoy making this recipe that will be ready in under an hour and that will fill your mouth with some of the most amazing flavors of the Mediterranean cuisine. Melt the first 1/4 cup fat in a large and hot pan and brown the chicken pieces on all sides. It will take about 6 minutes total. Set the chicken aside. Cook the onions until soft, about 3 minutes, and make sure to scrape all the delicious chicken bits off the pan while doing so. Add the garlic and cook for about a minute, until fragrant. You can season with salt and pepper at this point. Add the chicken stock, thyme and lemon juice and return the chicken thighs to the pan, skin side up. Bring to a simmer and put the pan, covered, in the hot oven for about 20 minutes. Remove the lid, add the halved olives as well as the lemon slices and bake for another 15 to 20 minutes uncovered. 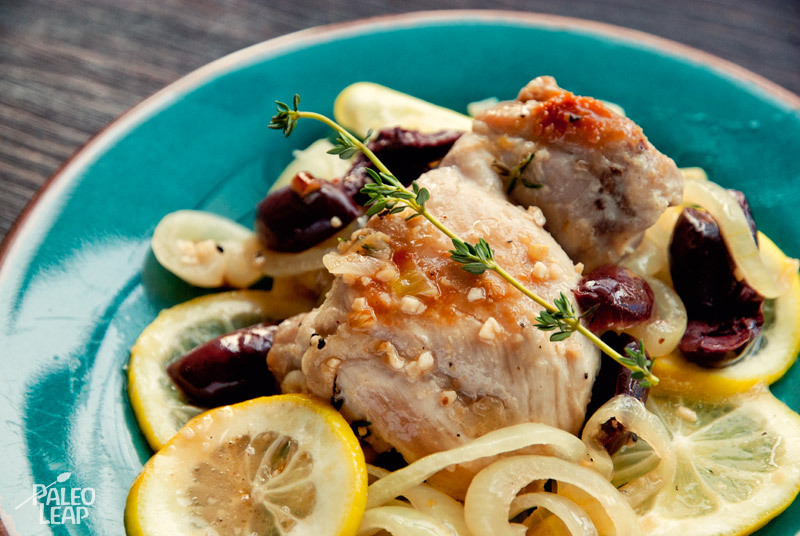 Serve the chicken with the olive, garlic and lemon sauce as well as with some of the lemon slices.